A free update for Endless Legend landed yesterday adding a new victory condition that lets you build a spaceship and flee the planet in a culture-wide mic-drop exit that will make your enemies sad. This victory is available to all factions, but only after they've completed "Faction specific Quests". The update also adds three new map generation presets including New World, which puts everyone on the same island so they can eat each other, Hunger Games style. The Scattered preset gives each faction their own island and Symmetrical does what you'd expect. A new minor faction called the Dorgeshi have also been included at the community's request and diplomacy has been expanded to let you ask other factions to declare wars on targets of your choice. There's good news for modders, too. They'll now "have access to the game Simulation" which should hopefully enable folks to make deeper rule changes and create more varied scenarios. 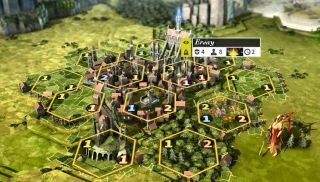 Endless Legend was the best strategy game of 2014, earning a commendation for design in our game of the year awards, thanks largely to the way it tries to innovate on staid turn-based strategy principles. It also has amazing, varied factions, like science vikings from space, and people made from soul dust. For more info, check out our Endless Legend review, and the Endless Legend site.